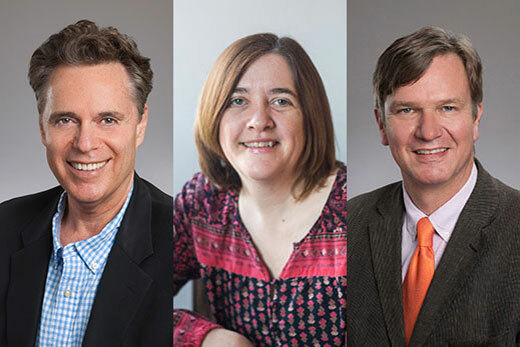 Emory professors Andrew H. Miller, Patricia Brennan and J. Douglas Bremner are among just 17 researchers around the country to receive Distinguished Investigator grants from the Brain and Behavior Research Foundation. Three Emory professors are among just 17 researchers around the country to receive Distinguished Investigator grants from the Brain and Behavior Research Foundation, the most of any university. The $100,000, one-year grant is the foundation’s largest award, designed to support innovative projects that seek new potential targets for understanding and treating a wide range of mental health disorders. No other university had more than two researchers earn the award. Emory College psychology professor Patricia Brennan and J. Douglas Bremner and Andrew H. Miller, both physicians and professors in the Emory University School of Medicine, received the 2017 awards announced in December. “By funding creative research that explores new ways to prevent, diagnose and treat psychiatric disorders, the Distinguished Investigator grants support and encourage established scientists to advance our understanding about mental illness and the brain and behavior disorders,” Jeffrey Borenstein, president and CEO of the foundation, says in a news release about the awards. Brennan’s project, “Out of the Mouths of Babes,” will employ a novel way to examine markers of stress and depression during gestation. Specifically, she will use baby teeth to look at fetal cortisol, c-reactive protein and interleukin-6, the latter measures of inflammation, to provide information about stress exposure across gestational development. Results from teeth assays will provide precise timing of exposures related to maternal depression, and help her to assess how those exposures affect the mental health and cognitive development of children of depressed mothers. Brennan had previously helped lead several large National Institutes of Health longitudinal studies that examined stress as well as perinatal and familiar risk factors in children’s cognitive development and physical health outcomes. She is also the co-principal investigator (with Elizabeth Corwin, PhD, RN, associate dean for research at Emory's Nell Hodgson Woodruff School of Nursing) on a five-year, $3.6 million NIH grant to examine how chronic maternal stress and disadvantage may affect an infant’s microbiome. “Our (foundation) project opens up a new realm of discovery for our ongoing longitudinal studies of prenatal risk by providing a direct ‘window’ into fetal exposures,” Brennan says. Bremner, a professor of psychiatry and radiology and director of the Emory Clinical Neuroscience Research Unit at Emory School of Medicine and the Atlanta VA Medical Center in Atlanta, uses neuroimaging and neurobiology measures to study the neural correlates and neurobiology of post-traumatic stress disorder (PTSD) related to combat and childhood abuse, as well as the related area of depression. His proposal, “Mechanisms of Electrical Treatment for Post-Traumatic Stress Disorder,” uses noninvasive vagus nerve stimulation devices to treat PTSD. This new approach has received increasing attention, and, if successful in PTSD, could have a significant clinical impact, potentially treating other disorders, such as severe anxiety. Miller, the William P. Timmie Professor of Psychiatry and Behavioral Sciences at Emory School of Medicine, is an internationally recognized leader in the area of brain-immune interactions as they relate to stress and depression in both medically healthy and medically ill individuals, including patients with cancer. His proposal, “Cellular Immune Mechanisms of Inflammation in Depression,” will explore monocyte immune function in depression as underlying inflammation in the disorder. Using 30 patients and 30 controls, he will explore nuclear factor kappa B, inflammasome, toll-like receptor 4, and chemoattractant protein, a c-reactive protein. This year’s $1.7 million Distinguished Investigator grants are the latest in more than $380 million the foundation has awarded since 1987 to fund research in neuroscience and psychiatry to better treat disorders ranging from addiction to schizophrenia.